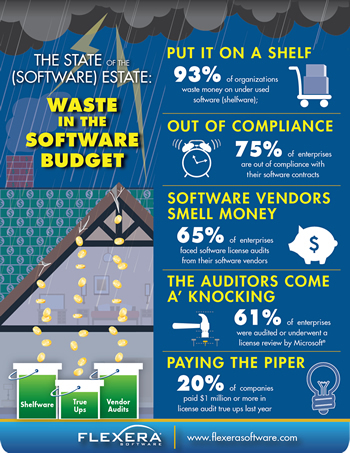 Out of Compliance: 75 percent of enterprises say that at least some percentage of their software is overused (i.e. use that is out of compliance with their license agreements). 23 percent were audited three times or more! Multiple Key Vendors Come a' Auditing: Respondents report having been audited or undergoing a license review by all the major software vendors including Microsoft (61 percent), Adobe (33 percent) and Oracle (30 percent). 20 percent (up from only nine percent the prior year) said their software audit true-up costs were $1,000,000 or more! 30 percent of respondents said that 21 percent or more of their software spend is associated with shelfware. "The software license landscape is complex due to the sheer number of contracts to manage, the different types of licenses that must be administered, the different rules adopted by different vendors, and the fact that many organizations track their licensing information manually. We believe that as much as 33 percent of the software budget is being wasted due to insufficient software license management," said R "Ray" Wang, Principal Analyst & Founder at	Constellation Research. "Organizations should focus on continual software license compliance to reduce software audit risk, and on fully utilizing the product use rights they've negotiated in their contracts to reduce shelfware." While the report paints a bleak picture of the massive waste most organizations are experiencing around enterprise software spend, it also provides an optimistic outlook that organizations are gaining awareness of the problem and looking for solutions. For instance, 81 percent of organizations said managing software licenses and usage is important. 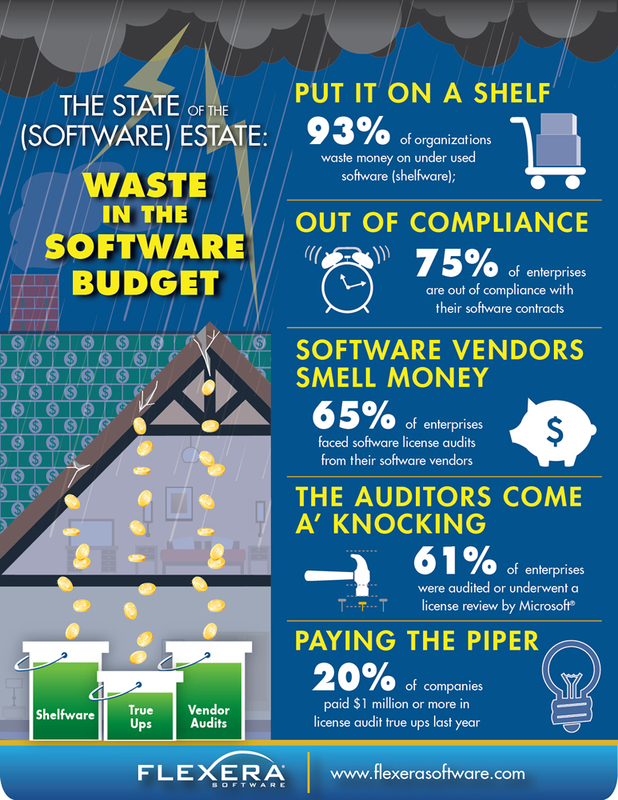 Most organizations, 92 percent, report proactively tracking, managing and reporting software licensing and usage today - although the methods they take diverge significantly- from manual methods (29 percent) to using automated commercial Software Asset Management (SAM)/Software License Optimization solutions (34 percent). "Organizations of all sizes are feeling the sting of software license audits, true-up fees and the frustration of trying to simultaneously stay in compliance and eliminate shelfware. The good news is Software Asset Management/Software License Optimization solutions are now being deployed more widely and for those companies, the problems are abating," said Ed Rossi, Vice President of Product Management at Flexera Software. "Organizations can leverage Software License Optimization solutions to score quick wins up front - inventorying their software estates for the first time, eliminating unused or unauthorized software from their networks or successfully defending themselves in a software audit. From there, they can go on to solve more complicated optimization problems that yield even greater return, such as strategies for fully utilizing all the software they've invested in before purchasing additional licenses." The 2016 Key trends in Software Pricing and Licensing survey was conducted by Flexera Software. This annual research project looks at software licensing, pricing and enforcement trends and best practices. The survey reaches out to executives at application producers (Software vendors and intelligent device manufacturers) and enterprises who use and manage software and devices. Now in its tenth year, the survey is made available to the industry at large each year.